It’s back to school time, and if you’re like most parents, you need to get your child to and from school (and other activities) each day. You can do it yourself, but you may have considered starting a carpool with other parents, to help share the load. If you have some other parents you trust, it’s definitely worth exploring. Here are some things to think about when setting up your own carpool, and ideas to make it a little easier and more fun for everyone. There’s driving your own kids, and then there’s driving… other people’s kids. Parenting styles are of course very individual, so it’s important to come to an agreement on all aspects of carpool rules and expectations. Here are some things to think about, and maybe discuss with your fellow parents when you set up your carpool. The thing about carpools is that their sole purpose is to get passengers places. On time. And it never fails—there will be one person in your carpool who’s habitually late in the morning. It’s important to set ground rules, with all the parents and kids in your carpool, from the beginning. Agree upon how many minutes the carpool will wait before heading on to school so the rest of the kids don’t arrive late. You can’t, of course, leave a child at school at the end of the day, because that isn’t safe—so it’s also important to have a way to reach them (ideally, if they have a mobile phone), and also their parents if for some reason you can’t find them when it’s time to take them home from school. Get comfortable in your chauffeur hat, because—don’t take it personally, but—no one wants to ride up front with you. So unless your carpool maxes out your car’s seating capacity, you’re going to have an empty shotgun seat at your side. As far as the rest of the car, hopefully everyone gets along and can manage self-seating peacefully, Southwest Airlines style. If not, you’ll need to determine rules for who sits where. If there’s a third row of seats, and if it’s seen as more or less desirable to be back there, you may need to work out a system for kids to take turns. This can be a slippery slope… maybe it’s driver’s choice, maybe you rotate whose playlist it is on a given day. A lot depends on the age of your carpoolers, and, if they’re older, whether you and the other parents are on the same page about which music styles/lyrics are acceptable. What are your rules about tablets, phones, and gaming in the car? Smartphones, handheld gaming consoles, laptops, tablets, digital music players… there are so many types of electronics, and so many reasons to allow them—and so many reasons not to allow them. 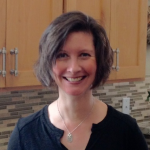 Do you want to encourage interaction? 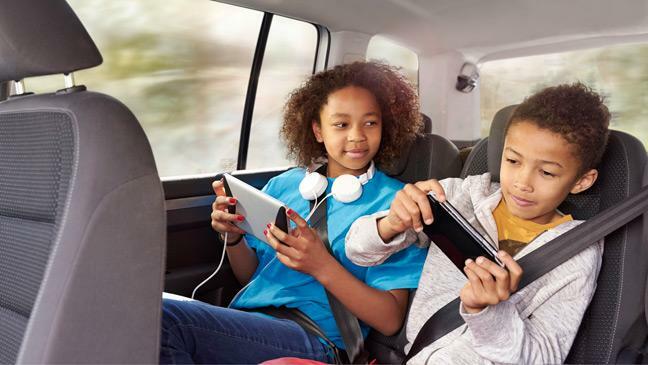 Are the kids in your carpool friends with one another? If so, the ride home can be a perfect debrief opportunity. It can also be a good way for parents to keep tabs on what’s going on at school, and to be aware of any potential areas of concern. But this isn’t always practical… in which case you may want to have some ground rules (ideally agreed upon with the other parents) about devices. Rules about screen time, device types, etc. are best decided by each carpooler’s parents. But you should think about what’s acceptable in your car, and the primary point is probably sound. For games, movies, etc, it may be a good idea to ask that everyone use headphones. If you do have a device-friendly car, you may want to think about having a charging cable or two available. An carpool pledge can be a great way to get everyone on the same page and to commit to the rules and behavior guidelines you’ve all agreed upon. Create it together, and then ask every parent and child to sign it and keep a copy. The blogger Scary Mommy came up with the 10 Commandments of Carpooling, which is a useful (and entertaining) list of things to consider. If your carpool drive is lengthy, it may be useful to have some games at the ready to keep your passengers occupied. One of the first games that comes to mind is the classic “I Spy,” which may or may not work for your carpool depending on the age of your riders. (Big kids may be too cool for this one. In which case it’s just as easy to call it “20 questions”; it’s essentially the same game, just substituting the overly cute “I spy with my little eye…” part with “I’m thinking of something that’s blue…”) The rest of the group continues to ask questions to try to narrow down and eventually guess the object in question. Quick, call out “punch buggy!” and (gently) slug the person next to you. The basic rules are simple. 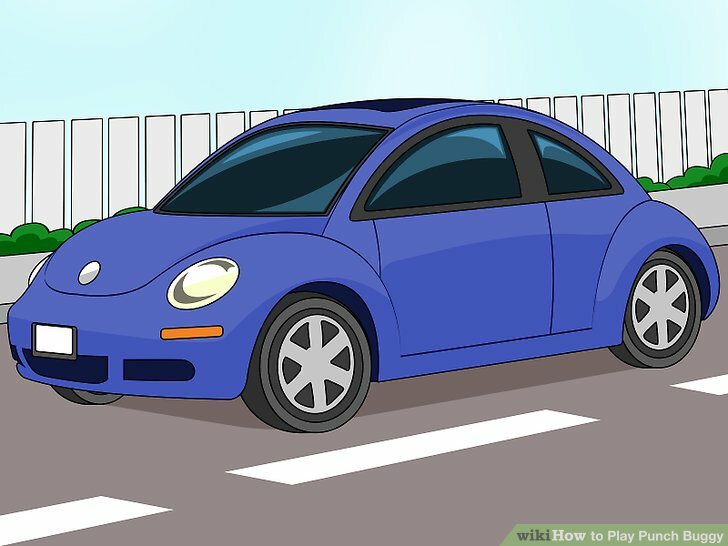 Spot a Volkswagen Beetle, or “bug,” and punch the person next to you, calling out “punch buggy!” Keep score as you go. You’re not allowed to punch anyone if you’re driving past a Volkswagen dealership. For obvious reasons. Because I grew up in Santa Cruz, we played a nonviolent version of this called “peanut,” in which you would simply say “peanut” when you spotted a beetle—omitting the punch—and keep a tally. Punch buggy can get a lot more elaborate—if you so choose. Simply refer to the Official Punch Buggy Game website, which will tell you everything you ever wanted to know. And possibly more. A more fun license plate game is license plate poker. This game is a little more complicated and would be best for bigger kids (and you may have to explain the basic rules of poker, if they’re unfamiliar.) Basically, “Each player chooses a plate and keeps the best five “cards” (e.g. a plate that reads 4PPU999 could be a full house with a pair of Ps and three 9s as the five-card hand.” Each player can write down the plate number that is their hand, or take a picture of it if they have a smartphone. Hangry. A recently-coined, extremely apt word for an age-old problem. Whether it’s children or adults, everyone is much happier when they’re well fed. So if you’re driving kids—especially if you’re picking them up at the end of a long school day—it’s important to make sure your snack game is on point! First things first. When it comes to kid snacks, this probably isn’t your first rodeo. But just to be safe, if you haven’t already, it’s probably a good idea to find out whether any of your carpool peeps are allergic to anything. If you need wholesome snacks that are quick and ready-to-eat, there are all the classics that most of us grew up with: string cheese and crackers, fruit roll-ups, dried granola bars, turkey or beef jerky, snack-sized chips. Healthy peanut butter balls are a relatively healthy, high-protein option. They only have three basic ingredients, and are pretty quick and easy to make. You can also add texture and variety by rolling them in cereal, mini chocolate chips, or cookie crumbs. Who doesn’t love Goldfish crackers? Here’s a healthier, homemade version—and everyone will probably be pretty amazed that you made your own Goldfish crackers. Not quite a popcorn ball, and not quite a rice krispy treat… but a winning combination if ever there was one. 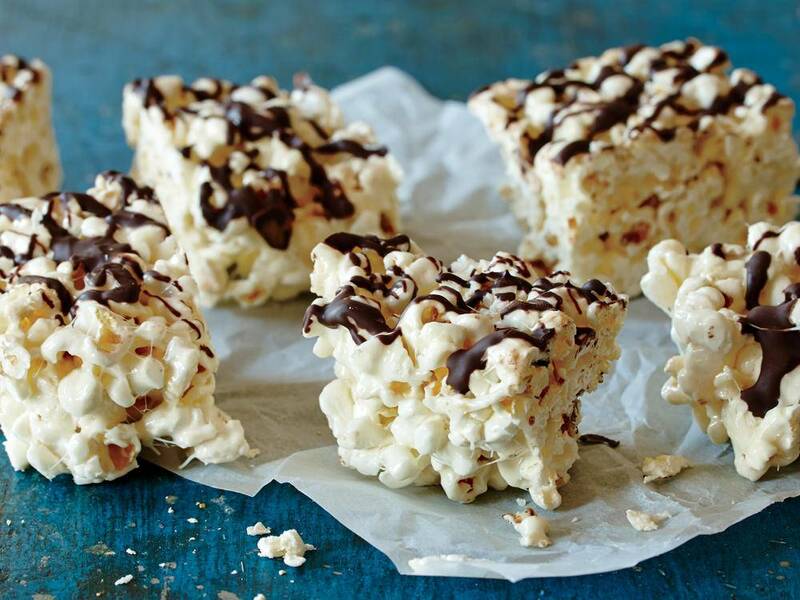 These marshmallow popcorn treats with chocolate drizzle will be a hit. If any of them make it out of your kitchen. Also, it’s always a good idea to have water available. You’re a parent, so you’re no doubt used to driving with distractions; we’ll skip the lecture on that. But what about making sure your car itself is safe? Here are some things to keep an eye on to make sure your trusty ride is sound and won’t leave you and your young companions of the road stranded anywhere along your route. It’s best to always have at least a quarter tank, so that you’re ready if you end up stuck in traffic for an unexpected length of time, or if your day just gets too hectic to allow for a gas station stop. Make sure you tires are in good condition, and that you replace them when they become worn. Check out our article on tire safety and what to look for. Wiper blades are, of course, a very important piece of safety equipment (and fortunately fairly easy and inexpensive to replace, when necessary.) Be sure to test them at the beginning of the rainy season, and periodically throughout, to make sure they’re doing their job so you can see the road in a downpour. The best way to make sure your car is at its safest and most reliable is to keep up with regular maintenance. Follow your manufacturer’s recommended service schedule for your car, and you should be good to go. Make sure you have contact information for each child (if they have their own phone), their parents, and at least one backup adult contact for each, in case you can’t reach a parent. It’s also a good idea to provide your school’s office with a list of the kids and parents in your carpool, so that there’s never any question of whether each child has permission to be picked up by each driver. One of the most important things to nail down, in the beginning, is the carpool schedule. Not only to map out days and times for morning pickup and afternoon drop-off, and which parent drives which days, but so many other things: which kids are riding which days? Does one of them have to stay for soccer practice after school on Thursdays? Have early swim practice on Fridays? Other popular apps to check out are GoKid, KiDCarpool, and Carpool – school edition. There’s no question that carpools are a great way to get kids safely and efficiently to and from school, while allowing yourself and other parents a little more flexibility in your weekly schedules. They can be a great way to bond with your child and their friends. And you’ll almost certainly end up with some entertaining stories and charming perspectives, simply by listening to the chatter in your backseat.